There are 11 images tagged with “metallic”. I wanted to do something with lots of jewel tones. Created entirely in Paint Shop Pro. This was an exercise in color symbolism. 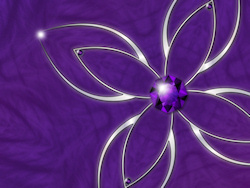 Purple often indicates royalty and wealth. Because it&apos;s (relatively) rare in nature, and purple dyes used to be difficult to make and therefore expensive, only the wealthiest could afford to dress in purple. This was the result of playing around with gradient overlays and an old Apophysis render that had been calling for me to find a use for it. The jewel is actually the first one I ever designed in 2008 following a tutorial, but for some reason I missed the part about how to add the shine and couldn&apos;t figure out why it looked so flat . Three years later I finally revisited it and came up with this. This was the result of playing with golden spirals. And the dark greens and blues, plus a little hint of purple, look like something under deep waters. I wanted to try drawing Dusky&apos;s green-gold eyes, and this stylized cat&apos;s face grew from that. 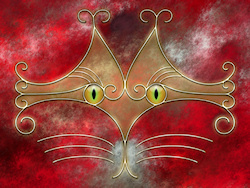 And a red fractal background from Apophysis completed the picture. This is still one of my favorites. 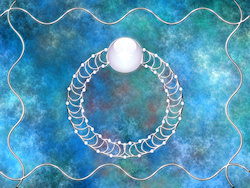 This is my stylized version of Nenya, the ring of water, one of the three Elvin-rings. 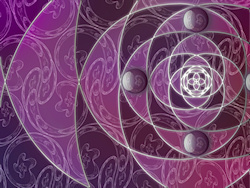 The background is an Apophysis fractal, the rest was drawn in Paint Shop Pro. The golden spiral can be found frequently in art and nature, including some galaxies and nautilus shells. I was playing around with this shape and with a fractal design in a similar spiral, and came up with this geometric design. 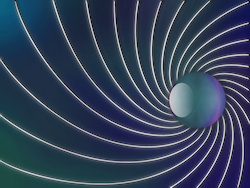 This picture came from my playing around with shapes in Paint Shop Pro. I started with a spiky silver shape and repeated and rotated it until it seemed to make a good setting for an Easter egg, and the rest of the design followed from that. And I love all the shades of maroon, pink, lavender, and blue that come out in the spring and summer! I wanted to try something metallic besides gold and silver, and I remember my high school Chemistry kit had a copper compound that was bright blue (azurite? ), so I decided to try them together. Then these butterflies showed up fluttering across my screen and offered to pose for me, so here they are! 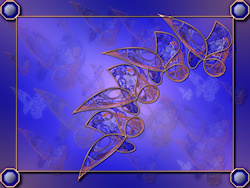 Actually it&apos;s an Apophysis fractal that I thought looked like a butterfly. 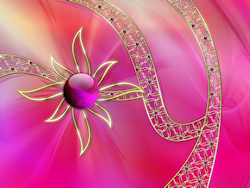 You have to have a good imagination working with fractals! This was also another attempt at drawing faceted gems. Hiddenite , or Lithia Emerald, is a rare green gemstone. It was discovered in western North Carolina in 1879, and named after the geologist William Hidden. This picture of course is not a photograph of actual hiddenite. 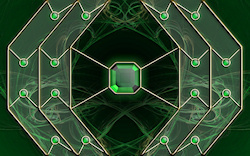 It&apos;s a combination of my drawing with an Apophysis fractal for the background. I laid out the design to give the effect of heading into a dark cave where such gemstones might be mined. 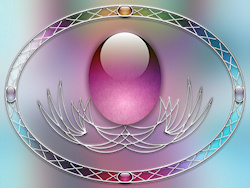 This piece was also an experiment in drawing faceted gems - they&apos;re harder than the round orbs.